Discuss racing, car prep, racing schools, HPDE's, and other track topics. DETROIT(April 8, 2019) –During the past 20-plus years, Corvette Racing has made its mark in long-distance endurance racing with multiple victories in the 24 Hours of Le Mans, Rolex 24 At Daytona and the Mobil 1 Twelve Hours of Sebring. But the program aims this weekend to add to its sparkling success rate at the shortest race on its yearly calendar with a return to the Bubba Burger Sports Car Grand Prix at Long Beach. The pair of bright yellow Chevrolet Corvette C7.Rs will look for a third straight victory on the streets of Long Beach and eighth at the event since 2007. More significantly, a triumph in Saturday’s 100-minute race would be Corvette Racing’s 100th in IMSA competition Coincidentally, No. 99 in North America came a year ago at Long Beach. It also gave Chevrolet its ninth Long Beach IMSA victory – the most among series manufacturers at the event. Oliver Gavin and Tommy Milner enter Long Beach as winners the last two years at the event in their No. 4 Mobil 1/SiriusXM Chevrolet Corvette C7.R. It was Gavin’s 50th victory with Corvette Racing, and he leads all IMSA drivers with five victories at the event. Milner, who drove the closing stint the last two years, is a three-time winner at Long Beach – all with Gavin. Two years ago, the Gavin/Milner duo were the benefactors when the No. 3 Mobil 1/SiriusXM Corvette of Antonio Garcia and Jan Magnussen were blocked at the final corner of the final lap by a trio of stopped cars. Milner had no choice but to slip through an opening to secure another Chevrolet victory. Last season Milner took the lead with about 20 minutes to go after a mechanical problem dropped Garcia from the lead just before a restart. Magnussen and Garcia last won at Long Beach in 2014 for the first victory for the Corvette C7.R. It was the first victory at Long Beach for Garcia and second for Magnussen, who leads all IMSA drivers with three pole positions at the circuit. The Bubba Burger Sports Car Grand Prix from Long Beach begins at 2:05 p.m. PT on Saturday, April 13. It will air on live on NBC Sports Network and the NBC Sports app starting at 5 p.m. Live audio coverage of practices, qualifying and the race from IMSA Radio is available on IMSA.com. • 1: As in one team, one manufacturer and one model of car for 21 years: Corvette Racing and Chevrolet. • 2: Consecutive victories for Oliver Gavin and Tommy Milner at Long Beach in the No. 4 Mobil 1/SiriusXM Chevrolet Corvette C7.R. They also were second in 2016. • 3: Pole positions at Long Beach for Corvette Racing’s Jan Magnussen – 2008, 2014 and 2017. Magnussen went on to win in class in ’08 and ’14. He also has set fastest race lap in class twice. • 4: Fastest race laps in class for Gavin, also the most among active drivers at Long Beach – 2008, 2010, 2012, 2013. All took place with the Corvette C6.R. • 5: Class victories at Long Beach for Oliver Gavin, the most among active drivers. He won in ALMS GT1 in 2007 and 2009, ALMS GT in 2012 and in GTLM the last two years. • 6: Number of drivers who have competed at Long Beach for Corvette Racing – Olivier Beretta, Antonio Garcia, Gavin, Magnussen, Johnny O’Connell and Tommy Milner. • 7: Number of Long Beach victories in 12 appearances for Corvette Racing – more than any other entrant in IMSA at the circuit. • 8: As in Chevrolet’s small-block V8. More than 100 million units have been sold worldwide and is the most successful engine in American motorsports. 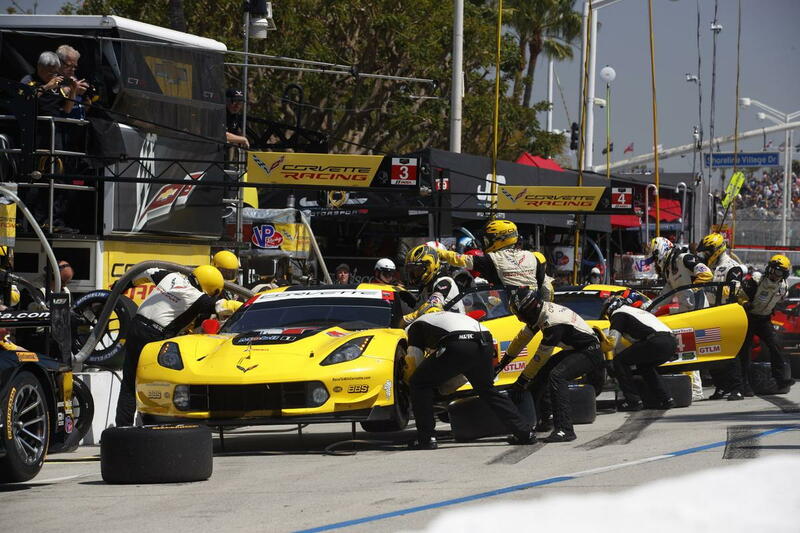 • 15: Number of GTLM wins for Corvette Racing since the start of 2014. That is the most of any manufacturer and team in the category. • 21: Tracks at which Corvette Racing has won races – Baltimore, COTA, Canadian Tire Motorsport Park/Mosport, Daytona, Detroit, Houston, Laguna Seca, Le Mans, Lime Rock, Long Beach, Miami, Mid-Ohio, Portland, Road America, Road Atlanta, Sebring, Sonoma, St. Petersburg, Texas, Trois Rivieres and Utah. • 50: Corvette Racing victories for Oliver Gavin, with No. 50 coming at Long Beach in 2018. • 216: Event starts by Corvette Racing since 1999. • 3,095.64: Number of racing miles completed by Corvette Racing in its 11 previous appearances at Long Beach. • 288,906.58: Total number of racing miles completed by Corvette Racing since its inception. To put that in perspective, it is roughly 239,000 miles from the Earth to the moon.